With Microsoft Plus! for Windows XP, you can personalize your computer experience like never before. Built exclusively to take advantage of the power of Windows XP, Microsoft Plus! delivers exciting new features for digital music, gaming, photos, and more. Tailor your digital audio and video to your own tastes, challenge yourself with a variety of fun and exciting games, and customize the look and feel of your desktop with amazingly lifelike screen savers and images. Everything you need to amplify your audio and video experience is included. Use the power of your voice to control Windows Media Player without lifting a finger. Easily create colorful, customized CD covers, labels, and inserts, and automatically add your own track listings and artwork using Plus! CD Label Maker. Enjoy stunning 3-D visualization effects, vibrant speaker enhancements, and a powerful personal DJ for automatically creating custom playlists in Windows Media Player. Quickly and easily convert your library of MP3 files to Windows Media Audio (WMA), saving valuable space on your hard drive. Challenge yourself with fun and exciting new games. Take the fun and excitement of bowling in 3-D into the streets of ancient Rome with HyperBowl Plus! Edition. Labyrinth Plus! Edition rolls the classic tabletop labyrinth game into a 3-D world filled with vibrant visuals and sounds. Test your skills for quick thinking and strategy with Russian Square, an intense new puzzle game for fans of Tetris. Customize your computer with 3-D graphics and photos. Personalize your computer with exciting new desktop visuals, including eight photorealistic 3-D screen savers and four enhanced themes, including wallpapers, screen savers, media player skins, and much more. Watch exotic fish come to life on your desktop in this amazingly lifelike recreation of a marine aquarium or display your favorite photos in a variety of custom-animated 3-D photo galleries. Even add your favorite background music. 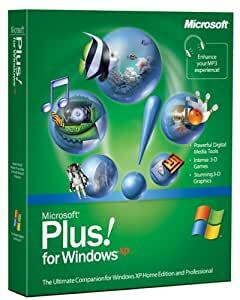 I received Microsoft Plus! XP as a gift and I really don't have the heart to tell my friend that they wasted their money. Oh, there are a couple of good things on the disc but nothing that really merits the purchase price. It's almost like the software was an afterthought - let's see what we can put in it since we don't really have anything. First off lets start the Digital Media collection. Nothing here really to speak of that's worth anything. A voice recognition system for the media player? It's not worth fighting with to run just a media player. The label maker, speaker enhancement and personal DJ? They don't do anything that really matters (or other software doesn't do without spending the extra cash). Media Player skins and Visualizations? You can download those for free from a number of sites - and again without paying for it. As for the MP3 audio converter, yes the new files are smaller but the only player you can use is the Microsoft one and the sound quality is not as good as an MP3. The games - there are only three and only one is a full version. The other two require downloads and additional purchases. The Bowling game is difficult to control and well, boring. The Labyrinth game isn't too bad but it's very difficult. The winner is Russian Square which is actually fun and addictive. As for the themes and screen savers - most aren't anything that special or noteworthy. The one exception is the aquarium screensaver which really is something to look at. But again, if you want the full version of the program you have to pay an additional cost. The rest aren't anything that really merits the cost of the program. Overall I'm really disappointed in the entire package - the cost is far too high for what you get and I can't help shaking the feeling the entire package is just a cheesy gimmick to sell you even more software. "Look at the great things in Microsoft Plus! XP" then when you buy it you find out you have to pay even more for the rest of the programs. this is the biggest gimmick from micro$oft, you buy or "buy" their overly expensive opperating system that you are basically forced to buy. And they don't include stuff, so you'll have to buy or "buy" later. The only thing i wanted this for was the ability to change my startbar colors and the themes, because silver and blue just dont cut it. I "bought" this off the interweb to see the different themes, and the stupid product overwrote some of my newer files; eg. windows media player, i wasn't sure if my version i had was older or newer than the one in plus!, and it made windows media player the default veiwer for a bunch of stuff like .mpg's and .mp3's was first lame thing that happend. the other themes were all lame, I had better looking themes when i used window blinds and StarDock skincaster. After using this product i think i'm going to buy Stardock since the choices in skins is far better. The only reason i gave this 2 stars was because of the pretty cool voice recognition thingy. For less than thirty bucks, you get a lot of software that Microsoft trusts to run on it's newest flagship. As to the themes, they are all very well done...and much better than you can find for free unless you are a diehard Britney fan. The games are only demos, the kind most of us download to see if they are worth buying. Most of them, I wouldn't give a thought to buying. But! The demos are engaging beasts in their own right, and the two level bowling game saved my soul from many a conference call. It doesn't tske much more thought than elf bowling, so you can pay attention to the call while playing it. The reason the magnificent Aquarium screen saver was not a full blown version is due to the FACT that the full version was not finished. I bought the full version, and believe me..it was not close to polished. It is now, but not back then. For twenty-something dollars, it is a fun buy. And for those of you that decided to spend the money on a bit of software instead of upgrading... well, live and learn. 3.0 out of 5 starsBack to the Drawing Board! I was very much disappointed by this product I was certainly hoping a product that would make Windows XP more spectacular but all I got was things that should be a part of the operating system anyway. The games are not full version, that's a major turn off, I was expecting more games too and some of them are memory hogs. Themes are great but could have gotten a little bit more for my money. What they should have done with this product was to include 10 categories of each feature, 10 games, 10 themes etc. Just to make the product at least seem worthy of the price you are paying, remember most of the features are not full versions, the fish tank for one is not a full version that hyperbowl thing is not full version. Media Player features are really not necessary and you need a lot of PC Horse Power for the voice recognition which I think needs better integration with the product itself. Overall most of the features in here you can find elsewhere online. The product price needs to be dropped also. I really like MS Plus! for XP, but I'm a bit disappointed in the feature limited screensaver options. The themes are nice, but they could be better, especially at this price.